We’re now going to discover probably the best part of the series: how to handle lightning! In the previous, we’ve fixed a random color per face to be able to see the mesh. We’re now going to change that to compute the angle between a light and each face to have a better illumination. The first algorithm reviewed is named the Flat Shading. It’s using per face normals. We will still see the polygons using this approach. But thanks to Gouraud Shading, we will go one step further. This one uses per vertex normals. It will then interpolate the color per pixel using 3 normals. To be able to apply the flat shading algorithm, we first need to compute the normal vector of the face. Once we’ve got it, we need to know the angle between this normal vector and the light vector. To be more precise, we’re going to use a dot product that will give us the cosine of the angle between those 2 vectors. As this value could be -1 and 1, we will cut it between 0 and 1. This final value will be used to apply the quantity of light to apply to our face based on its current color. In conclusion, the final color of our face will be = color * Math.Max(0, cos(angle)). Let’s start by the normal vector. The wikipedia definition Normal (geometry) says that : “For a convex polygon (such as a triangle), a surface normal can be calculated as the vector cross product of two (non-parallel) edges of the polygon”. The blue arrows are the normals to the faces. The green and red arrows could be any edge vector of the face. If you want to even better understand where these normal vectors will be, let’s take our Suzanne Blender model as a second illustration. We need to define a light after that. Our light for these tutorials will be the simplest one: a point light. The point light is then simply a 3D point (a Vector3). The quantity of light that our face will receive will be the same whatever the distance from the light will be. We will then simply vary the intensity based on the angle between the normal vector and the vector made of this point light and the center of our face. Normally, we would need to first compute the normal vector. Fortunately, Blender is computing those normals for us. Even better, it exports the per vertex normals we will use in the second part. So to compute our normal vector, we just need to take the 3 vertices normals, add them to each other and divide them by 3. We need to do several refactoring tasks to our code to be able to handle the concepts described before. Up to now, we were only using an array of Vector3 for the vertices. This is not enough anymore. We need more data embedded: the normal associated to the vertex (for the Gouraud Shading) and the 3D projected coordinates. Indeed, the projection is currently done in 2D only. We need to keep 3D coordinates projected into the 3D world to be able to compute the various vectors. We will then create a structure containing 3 Vector3: the current coordinates we’ve been using so far, the normal to the vertex and the world coordinates. The ProcessScanLine method will also have to interpolate more data (such as the per vertex normals in the Gouraud Shading). So we’re creating a ScanLineData structure for that. – Project() is now working on the Vertex structure and is projecting the vertices coordinates in 3D (using the World Matrix) as well as projecting the per vertex normal. – ProcessScanLine() is now varying the color using the NDotL value sent by DrawTriangle. We currently only have 1 color per triangle as we’re using Flat Shading. On my Lenovo X1 Carbon (core i7 Ivy Bridge), I’m running this 640×480 rendering around 35 FPS in Internet Explorer 11 (which seems to be the fastest browser for this demo on my Windows 8.1 machine) and around 4 FPS on IE11 on Surface RT. The C# parallelized version runs the same scene in 640×480 at 60 FPS. If you’ve managed to understand the Flat Shading, you’ll see that the Gouraud Shading is not complex at all. This time, rather than using 1 unique normal per face, and thus a unique color per face, we’re going to use 3 normals: 1 per vertex of our triangles. We will then have 3 level of colors defined and we will interpolate the color of each pixel between each vertex using the same algorithm used in previous tutorials. Using this interpolation, we will then have a continuous lightning on our triangles. You can see in this figure the differences between flat shading and gouraud shading. The flat uses a centered unique normal and the gouraud uses 3 normals. 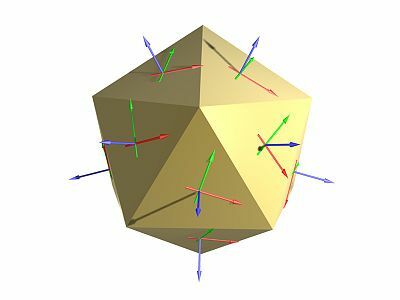 You see also on a 3D mesh (the pyramid) that the normal is per vertex per face. I mean that the same vertex will have different normals based on the face we’re currently drawing. In this figure, imagine that the upper vertex normal has an angle > 90 degrees with the light direction, it’s color should then be black (minimum level of light = 0). Imagine now that the 2 other vertex normal has an angle of 0 degree with the light direction, this means that they should receive the maximum level of light (1). To fill our triangle, we’re then going to interpolate to color level between each vertex to have a nice gradient. As the code is pretty straightforward, simply read it and you’ll see where I’m implementing the interpolation of the color. You’ll see that the performance/FPS are almost the same that with the Flat Shading algorithm but with a much nicer rendering. There is an even better algorithm named the Phong Shading with uses this time per pixel normals. And we will also see the exact same 3D object in a WebGL engine. You’ll then understand why GPU are so important to boost the performance of a real-time 3D renderer! Awesome and very impressed by your knowledge in the area. Thanks for a really great in-depth presentation. These are the best that I have seen. I am looking forward to the next lesson! hello,i think that normal vector should be calculated with every rotation why do you get them form blender and do they are static value! !..i wonder also what are world coordination. world coordinates = global coordinates. Why do you transform the normal using world matrix? This seems not right and as consequence of this mistake: if an face has negative z coordinates then lighting make the face always black even if the face is turned to the light.